You’ll be glad to know that the RapidRide D improvements along 15th Ave NW, at NW 53rd Street, are beginning. The improvements include construction of a crosswalk, crossing signal, and traffic island as part of a larger construction package that is addressing “spot” improvements around Seattle. The project is schedule to be completed by the end of 2018. Seattle Department of Transportation will have intermittent lane closures on 15th Ave NW, north of the Ballard bridge, affecting the outer southbound and northbound lanes for the next 6-8 weeks. Two lanes of traffic will remain open in each direction for the duration of the project. Outer southbound and northbound lane closures of 15th Ave NW will occur intermittently. 15th Ave NW southbound will be open to three lanes 6-10 a.m. and 4-6 p.m. Monday-Friday, and noon to 4 p.m. on Saturday and Sunday. 15th Ave NW northbound will be open to three lanes 3-7 p.m. Monday-Friday, and noon to 4PM on Saturday and Sunday. No parking and local access only on NW 53rd St between 17th Ave NW and 14th Ave NW. Here’s what the project should look like when complete. Remember the NW 53rd Greenway? It has been a couple years since we’ve written about it (see: 05/2016 and 06/2016), but last week a neighbor contacted us asking if the project was still active. A quick email to Seattle Department of Transportation revealed that the project was indeed moving along. 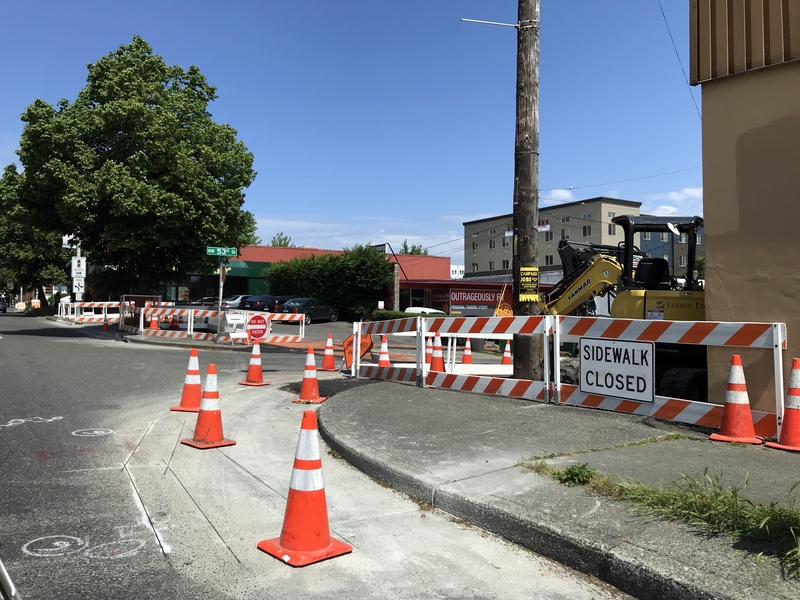 SDOT is working towards the installation of a new pedestrian signal at 15th Ave NW and NW 53rd Street as part of an effort to connect the Ballard neighborhood. This new signal will create a dignified way for residents to access bus stops, parks, and medical care without needing to travel a half a mile out of their way in order to find a safe crossing. Below, you can read the full update from the Seattle Department of Transportation, Spot Improvements. 15th Ave NW is a major street carrying around 50,000 vehicles a day. It is a bus priority corridor and a major truck street. RapidRide D and the 15 Express use the street and move about 15,000 people a day. Currently bus routes experience delay northbound between NW 51st St and NW Market St. We want to retain and grow the number of people taking the bus. So to make service more reliable and faster, we’re planning a bus only lane in this area. Buses can then bypass traffic that occurs when the drawbridge is lowered. To make room for the bus only lane, we’ll remove the center turn lane. Construction is scheduled for late 2017. This busy street also divides the neighborhood. There is almost a half a mile between traffic signals at Leary and NW Market. To help reconnect the neighborhood we’re adding a pedestrian signal. The improvement will happen at NW 53rd St.